Wednesday was our day on our own! 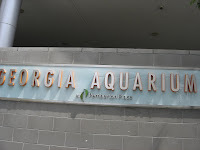 We decided to drive down to Atlanta and go to the Georgia Aquarium. 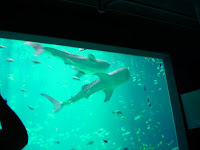 It's a very nice aquarium. 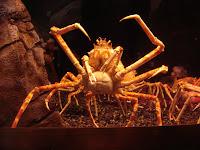 We saw some very cool & creepy Japanese Giant Spider Crabs and Beluga Whales as well as otters, sting rays, and whale sharks. 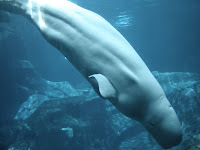 The male beluga whale was in a frisky mood and we were 'lucky' enough to see the whales mating. 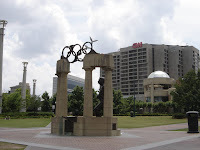 We had a quick snack in the cafe and browsed the gift store before heading across the street to Centennial Olympic Park. 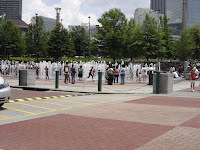 The Centennial Olympic Park is very nice and there's a Fountain of Rings where many children and adults were splashing through the waters. After wandering through the park, we decided to find an ice cream place called Morelli's. 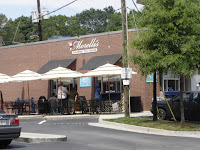 We read about Morelli's in a recent Bon Appetit issue that listed delicious gourmet ice cream places. 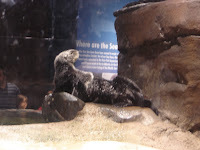 Morelli's is about 8 miles from the aquarium. They have many gourmet flavors. SP sampled the coconut jalapeno, sweet corn, and rum raisin flavors. 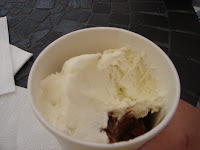 We bought and enjoyed scoops of lemon sorbet (on the left in the photo), ginger lavender (on the right), chocolate bourbon, and death by chocolate. 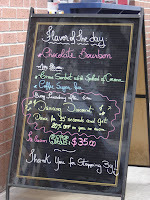 The chocolate bourbon was my favorite. The chocolates are under the other flavors. 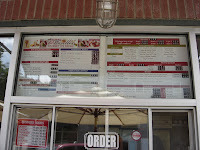 I really wanted to try the daily special lime sorbet with a splash of corona, but they were already sold out of it. 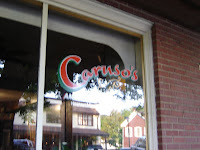 After ice cream, we drove back up to Dahlonega and went to dinner at Caruso's. Caruso's serves Italian food and they also are a brew pub. 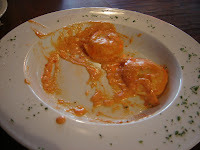 For dinner we split the lobster ravioli in red pepper cream sauce and a Greek pizza. The lobster ravioli were good but there were only four ravioli so it wouldn't have been a large enough dinner for a large eater. 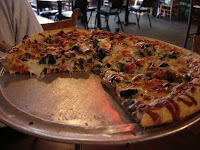 The Greek pizza had spinach, feta, sun dried tomatoes, and olives. It was delicious.